A no salt diet goes beyond not adding salt to your food. If your doctor has prescribed a low salt or salt-free diet, then you may need to change the way you eat. Salt is a compound made up of two elements, sodium (Na) and chloride (Cl). Salt comes in many forms including table salt, sea salt, kosher salt, and iodized salt. All types of salt contain sodium chloride. It is also a ubiquitous additive in both processed and restaurant foods, because adding a little bit of salt to a recipe enhances the flavors. If you begin to read the labels of foods you buy in cans, boxes and other containers, you will quickly discover that almost all of them contain salt. The problem with salt lies in its sodium content. Your body needs sodium; however, it only requires trace amounts. High levels of sodium in your diet can lead to fluid retention, hypertension, and increased risk of heart disease, heart attack, and stroke. The recommended daily intake for sodium is 2,400 mg per day; however, the average American diet contains significantly higher levels of sodium than is recommended. The American Heart Association recommends eating fewer than 1,500 mg of sodium per day if you suffer from hypertension. Because of the ubiquity of salt as a food additive, eating a no salt diet may be difficult; however, a low-sodium diet is quite achievable. Some natural foods contain trace amounts of sodium but most fall within healthy levels. When sodium ramps up in foods is during processing. The following suggestions can help you minimize the sodium in your diet. If it comes in a can, box, jar, package, wrapper or bottle, there's a good chance it contains salt and/or high sodium levels. If you are on a salt-free diet, then you will need to avoid processed foods altogether. If you are on a low-sodium diet, then you need to become a label sleuth. Read labels to determine how much sodium the packaged foods you buy contain. Fresh fruits and vegetables don't contain added salt. If you are on a no-salt diet, you should eat fresh fruits and vegetables. Avoid canned or frozen fruits and vegetables, which may contain added salt. 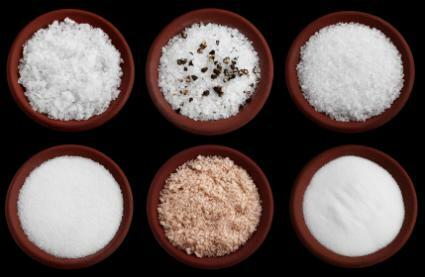 Most fresh meat, fish, seafood and poultry don't contain added salt; however, in some cases, manufacturers will inject a salt solution in poultry to plump it. When you purchase meat, read the labels to see if it contains solution. If you are unsure, ask the butcher. Deli meats almost always contain salt solution, as do cold cuts and processed and cured meats such as bacon, ham and sausage. Dried meats like beef jerky also contain salt. Dried legumes typically don't contain salt, but check the label to be sure. Canned legumes, nuts and seeds usually contain salt, although it is possible to buy low salt or salt-free versions. Read labels carefully and avoid those with added salt. Some dairy products contain salt and some don't. Cheese is usually quite high in salt. Milk and plain yogurt usually don't contain added salt. The more processed the grain, the more likely it is to contain salt. Almost all baked goods contain salt because it is an essential part of the baking process. Dried rice, whole oats, barley and other minimally processed grains are less likely to contain salt. If you are on a salt-free diet, then you will need to specify to the server that you cannot have salt when you order. Most chefs are familiar with salt-free diets and can make a meal of fresh meat and vegetables to fit within your diet. A salt-free diet can be achieved by eating minimally processed, fresh foods. Talk to your doctor about a low-salt or salt-free diet.